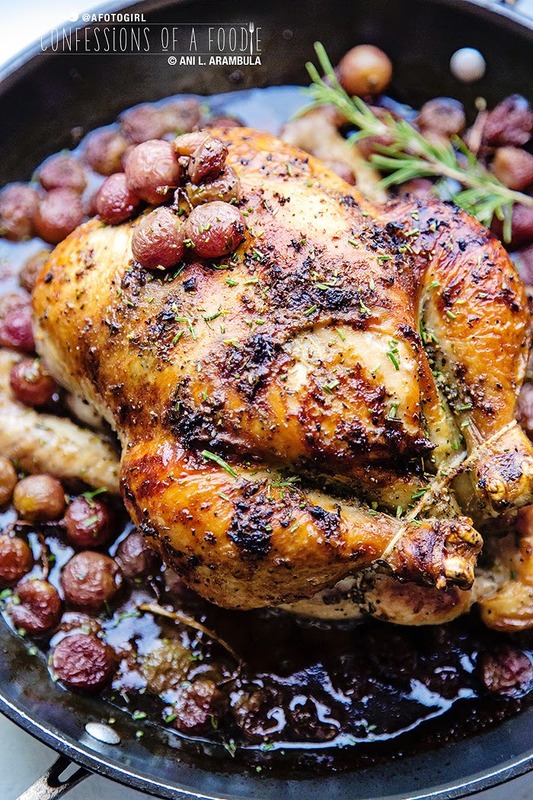 Simple and satisfying, a whole roasted chicken is the meal that keeps on giving. Use leftovers for salads, sandwiches, soups. 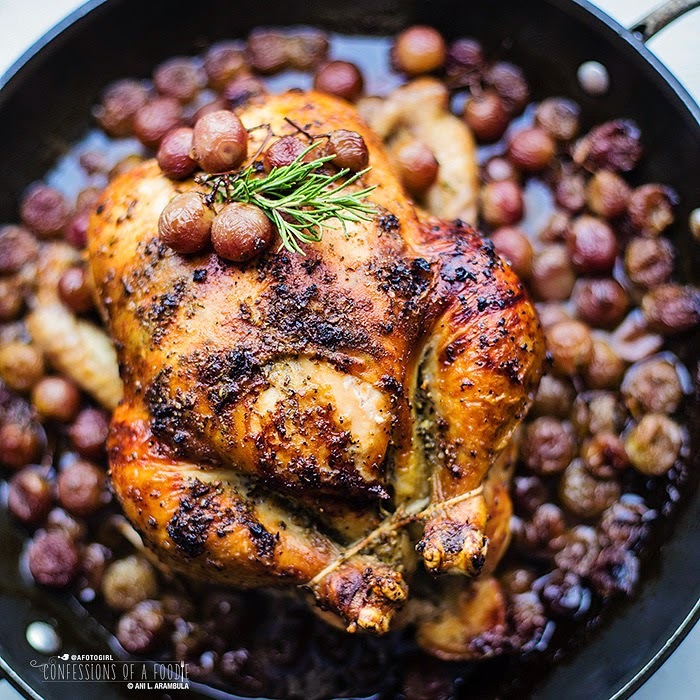 This Rosemary Roasted Chicken with Muscato Grapes is an elegant and fragrant dish easy enough for everyday cooking but fancy enough for company. For the amount of time I have spent in the kitchen, one would think that roasting a chicken would be old hat by now. I should have dozens of roasted chickens in my culinary past. I confess, I can count the number of chickens I've roasted in my lifetime on one hand. Perhaps it's memories from my teen years of eating supper at friend's homes and being served dried out chicken breasts that made me fearful that I could do no better. Or maybe it's the intimidation of staring at an entire chicken on a cutting board, string in hand, trying to figure out what the heck "truss" means? Or maybe it's just the convenience factor of being able to swing by nearly any grocery store these days to pick up a rotisserie chicken, no knowledge of trussing needed. You know what, though? Half of the time, those rotisserie chickens have been sitting under hot lights long enough for the breasts to dry out anyway and the meat on the legs becomes so hard and stick-like that they wind up as chew workouts for Starbuck. Roasting a chicken at home was becoming more and more appealing with every disappointment I had with store bought rotisserie. Truth be told, there really isn't anything like the smell of a roasting chicken as it filters throughout the house, stirring memories of weekends with family gathered around the kitchen table. It's comfort food times ten. And it's a dish that keeps on giving: leftovers can be made into chicken salad, shredded for chicken tacos, used in soups or tossed with greens. I'm determined to roast more chickens this year. So far, I've done it twice. The first time I used Jamie Oliver's recipe for chicken roasted in milk with cinnamon. It was tasty and different and a recipe I plan on trying again (I had no sage when I made it and it definitely felt like it needed it to balance out the cinnamon). Then there's this creation that I'm sharing today, my second roasted chicken this year and one that I will be going back to -- a lot. I recently bought and downloaded The Flavor Bible for my Kindle for iPad after having come across mentions of it at least a half dozen times in less than a week. I'm so glad I did. It's so inspiring and it's giving me new ideas for recipes. It's so easy to become accustomed to using the same old combination of ingredients but this book is allowing me to mix it up in ways I would not have thought possible. LIke roasting chicken with grapes. This idea totally came about after reading the entry for grapes. You see, I am continuing to benefit from the produce box sent to me from Melissa's Produce for the Alex's Lemonade Stand Blogger Challenge. These lovely red Muscato grapes have been sitting in my refrigerator since I got the produce and though wonderful eating straight off the vine, they were screaming for a more creative use. Nearly all of the ingredients I choose to make this dish with were included in the pairing list for grapes. I bit the bullet and went with it and I gotta say, this roast chicken was moist, fragrant and utterly delicious. Try it. Let me know how you like it. Feel free to substitute any seedless red grapes. I left a few on the vines for photo styling purposes but next time I make this, I'm definitely taking all the grapes off their vines. I preferred the loose grapes as they fell apart, their juices mingling with the butter and olive oil, creating a lovely sauce for the chicken. Skip the trussing if you must but I definitely felt that it helped keep the bird juicy by trapping the steaming lemon in the cavity. Afraid to truss? 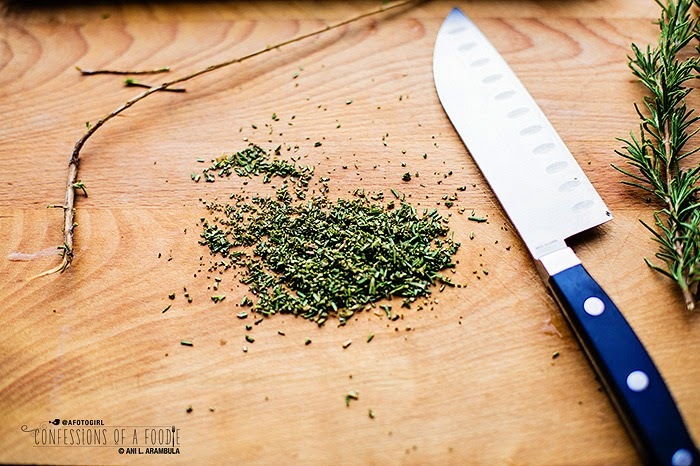 Scroll to the end of this post for an entertaining video on trussing from Mark Ruhlman. Also, I rely on Julia Child to help me determine roasting time: 45 minutes plus 7 minutes for each pound. You'll need a 10 - 12 inch heavy skillet (preferably a cast iron although my cast iron is only 8 inches so I used my commercial grade Calphalon skillet ). And if you truss, you'll need kitchen twine . Preheating the skillet not only shortens the cooking time, but it gives the thighs a little more heat so they start cooking immediately (a tip I picked up from America's Test Kitchen). Besides, I loved the sizzle and steam the chicken made the moment it heat the hot pan. 1. Place your skillet in the oven; preheat oven to 450 degrees. 2. 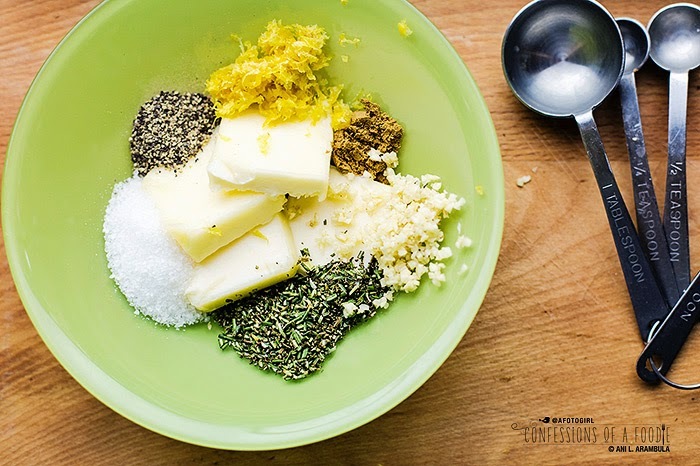 Make the compound butter by placing all the ingredients in a small bowl and stirring well to incorporate; set aside. 3. 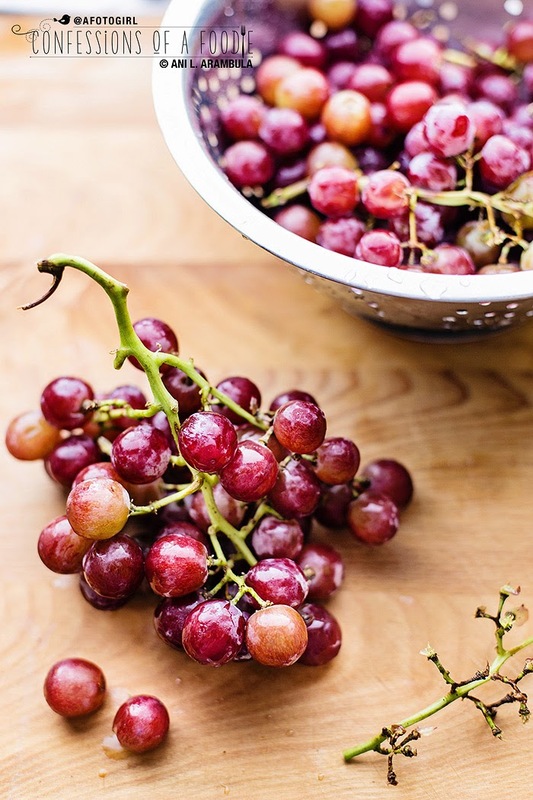 Rinse the grapes, shaking off excess water, then place in a bowl. 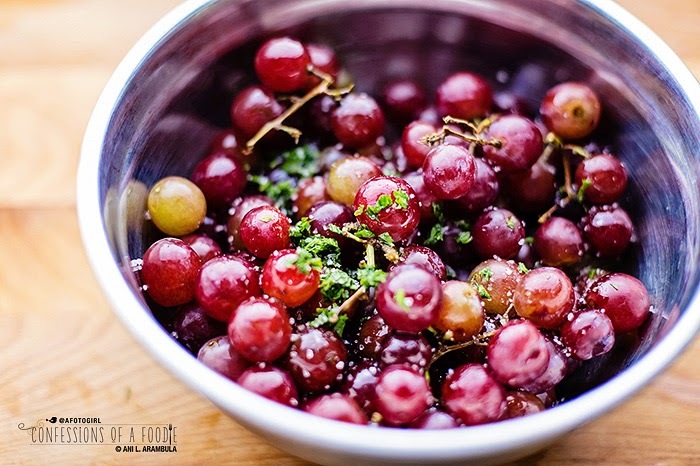 Drizzle the olive oil and vinegar over the grapes. Sprinkle with the salt and the chopped mint; toss to coat and set aside. 4. Rinse and FULLY DRY the chicken, including the cavity. This ensures a crispier, tastier skin. Place the chicken on a work surface with the cavity facing you. Carefully slide two fingers in between the skin and breast meat to create pockets to fill with butter. Take care not to tear the skin. Massage a quarter of the butter directly onto the meat of each breast under the skin. 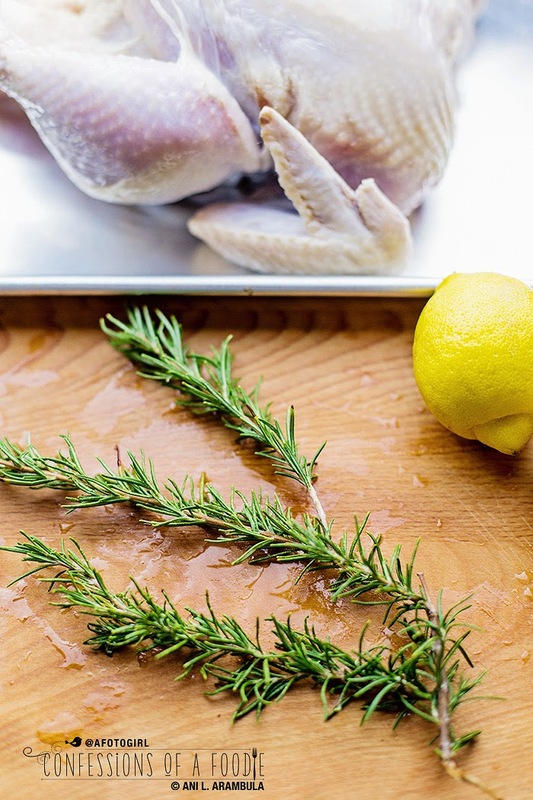 Cut the lemon in half and place both halves into the cavity of the chicken along with the two sprigs of rosemary. Truss the chicken (see video below) then massage the other half of the butter mixture all over the chicken. 5.Carefully pull the hot pan out of the oven and onto the stove. 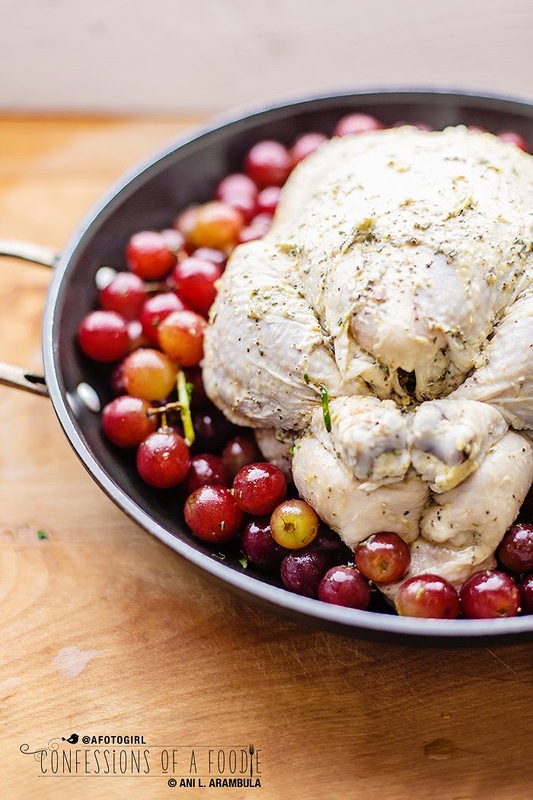 Lay the chicken in the center (chicken will sizzle) and surround the chicken with the grapes, making sure to scrape out the olive oil and mint from the bowl with a rubber spatula. Return pan to the oven and roast for 60 - 80 minutes or until the temperature in the thickest part of the leg reaches 165 degrees Fahrenheit and/or the juices run clear with poked. 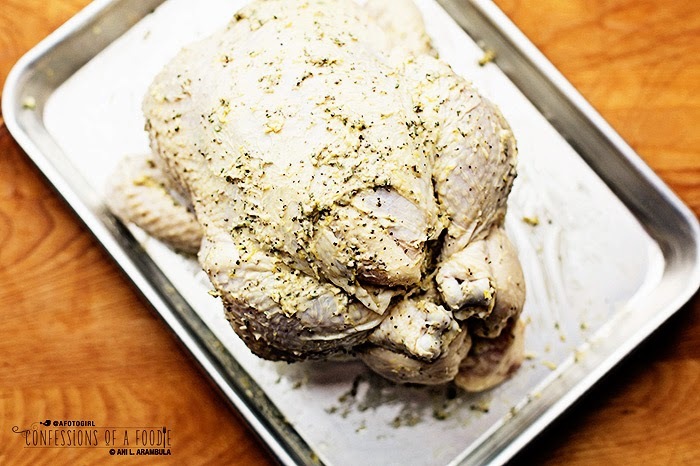 Remove the chicken from the oven and allow to rest for 15 minutes before serving. Serve the chicken with the grapes and some of the pan juices on the side. Have a great week guys and roast a chicken! 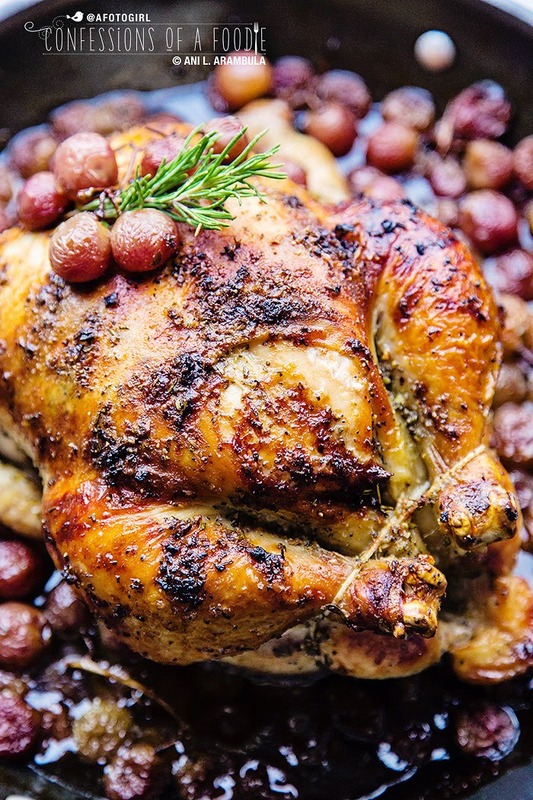 Gorgeous post, Ani - and I am definitely adding grapes to my next roast chicken, a fabulous touch. Thank you, Liz! Let me know what you think when you try it. I thought it was a great tasting combo! this is probably the best looking roast chicken i have ever seen... i could so devour a massive plateful right now, looks delicious! What a recipe! This is my kind of meal. Yum. Ani, this looks incredible!! 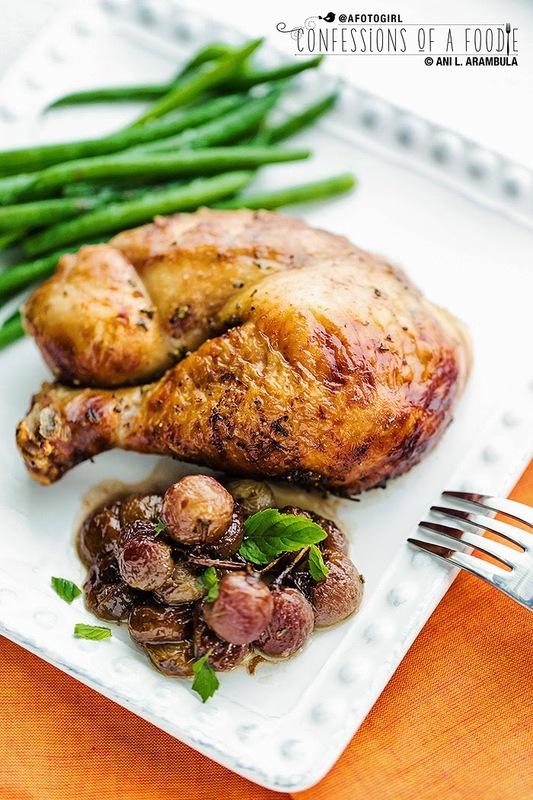 Roast chicken is a favorite in our house, but the grapes make this extra special! Your photos are freakin' amazing, too! I just want to jump right into that photo and eat until I'm stuffed! Love it! Simply gorgeous, Ani! Makes my mouth water. This has become my go to chicken recipe! I substitute the butter with olive oil and sometimes add a little honey. So good!! Thank you! I've made this twice now and it's the very best roasted chicken I've ever made! Thank you so much! It's outstanding! Yay! So glad you enjoy the recipe. That makes me so happy! That's so great to hear! I love that the mint worked for you. Grapes and mint make such great bedfellows! :) I was a little unsure when I started developing this recipe, too, but it's truly one of my favorite dishes now. Thank you for trying the dish and coming back to let me know how you liked it. Absolutely fabulous recipe. I make this often and my guest's love it. It's in the all time favorites recipe category. Truly outstanding chicken dish. 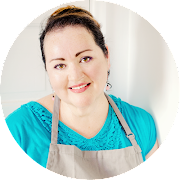 Thank you for sharing this with all of us and I'm looking forward to trying out other recipes on your blog. This Chicken looks amazing. Will do it for Christmas Dinner. Thank you so much for the inspiration and have a lovely Christmas!